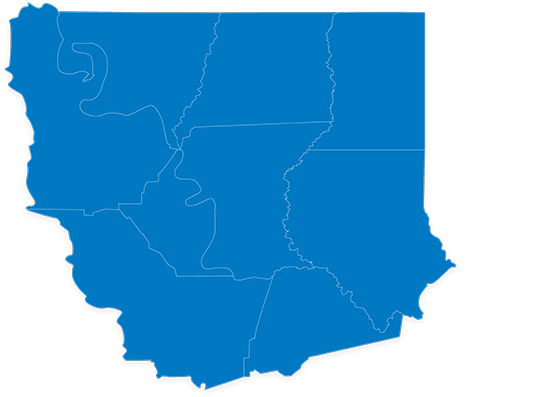 As a regional organization, BRAC works collaboratively with parish economic development partners throughout the nine-parish region to grow jobs and wealth in the area. This sense of regionalism and partnership is critical to BRAC’s work. 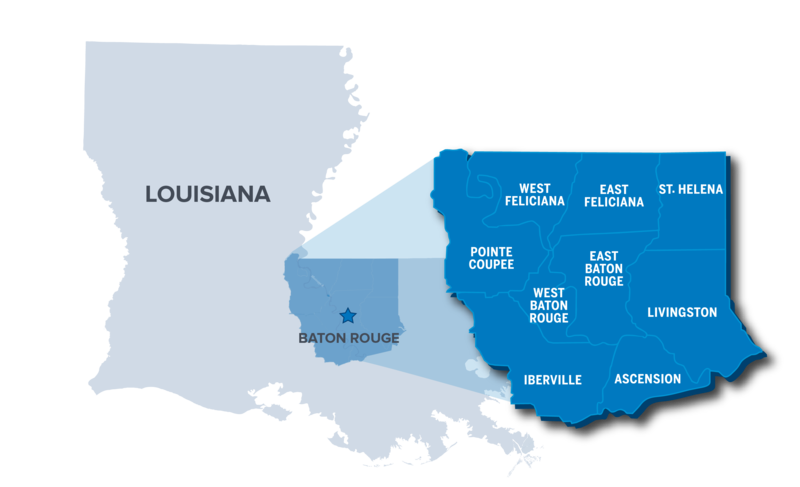 As a regional organization, BRAC works collaboratively with parish economic development partners throughout the region to grow jobs and wealth in the area. This sense of regionalism and partnership is critical to BRAC’s work. 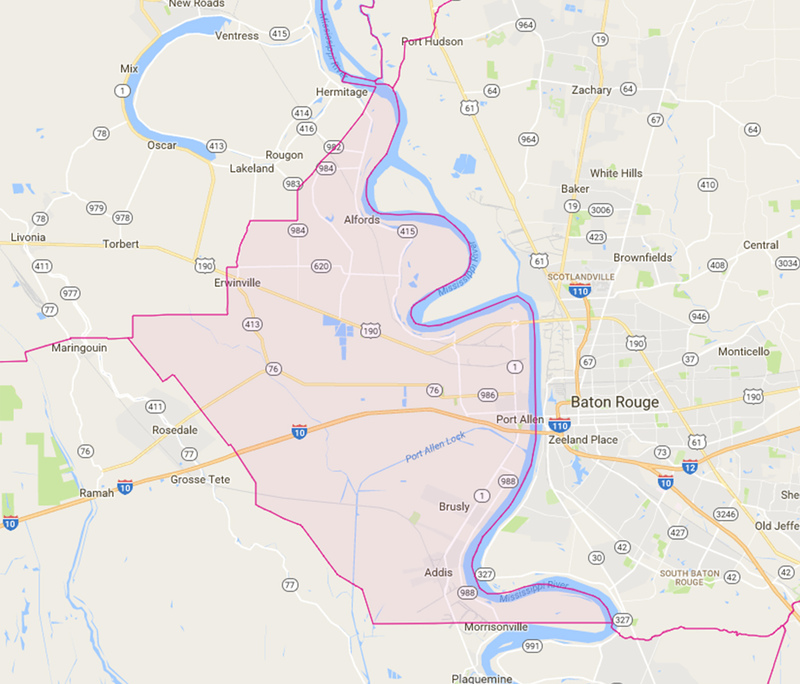 BRAC works with the City-Parish of East Baton Rouge to support business development for the parish and maintain strong cooperation between its urban center and the region. At the state level, BRAC works with Louisiana Economic Development, the agency responsible for strengthening the state’s business environment. 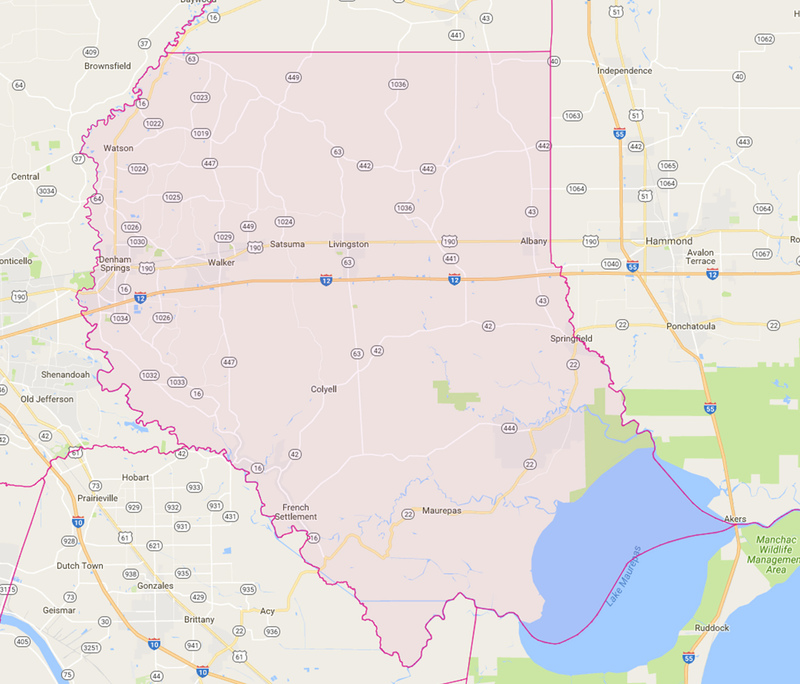 Ascension Parish covers approximately 300 square miles and is located between New Orleans and Baton Rouge in the heart of plantation country. Residential development is booming in Ascension because of its convenient location and strong public school system, which ranks among the top 10 districts in the state. 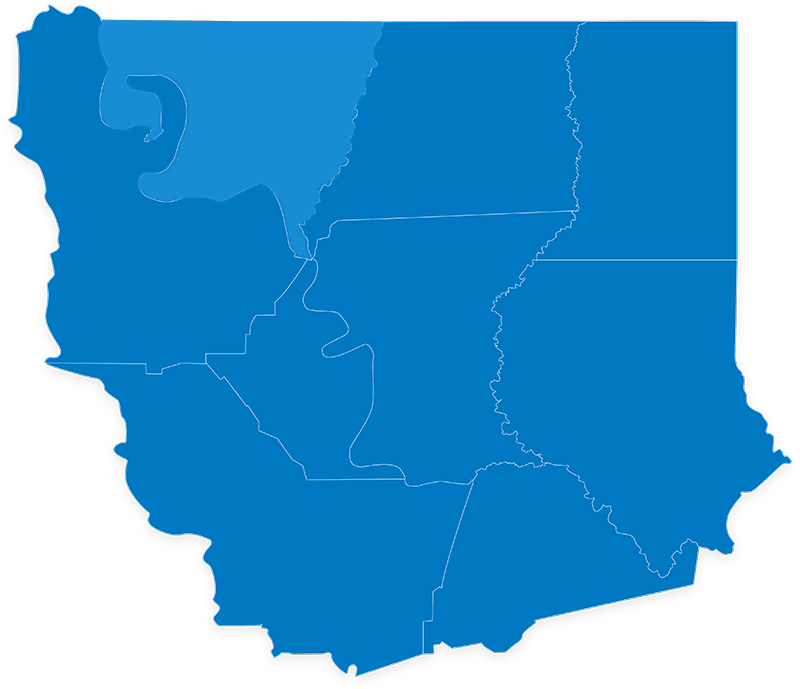 Ascension includes the municipalities of Donaldsonville, the seat of local government; Sorrento, home to the River Parishes Community College; Gonzales, also known as the “Jambalaya Capital of the World.” Gonzales is the location of the Tanger Outlet shopping mall and the Lamar-Dixon Expo Center, a multi-use facility that hosts equestrian, 4-H and many other family-friendly events. East Baton Rouge Parish is the home of the capital of Louisiana and to Louisiana State University, Southern University and Baton Rouge Community College. 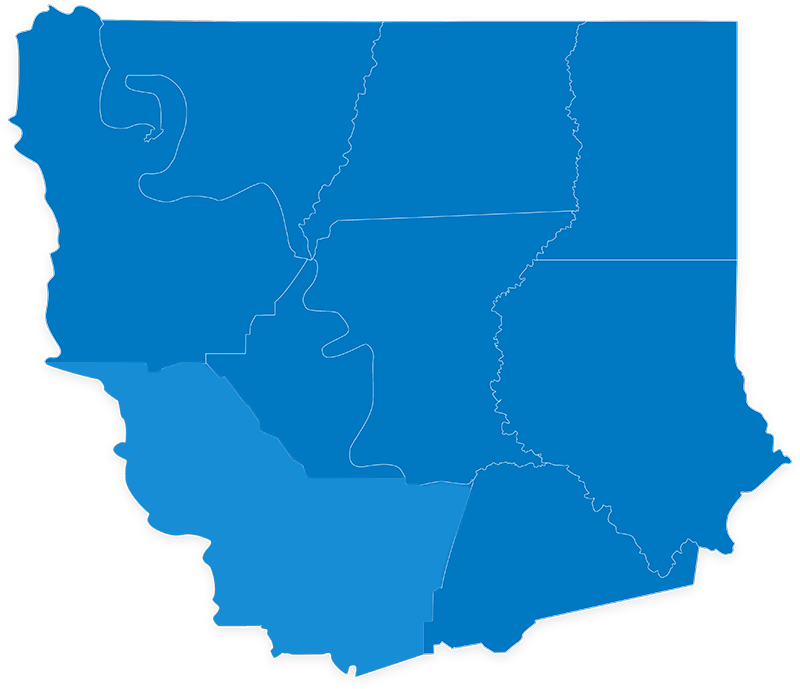 The city of Baton Rouge, one of the fastest-growing cities in the South, lies along the eastern banks of the Mississippi River. Downtown Baton Rouge is the site of the Governor’s Mansion, the State Capitol building, the Louisiana Arts & Science Museum, and the Raising Cane’s River Center, a venue for large events such as concerts, theater performances, trade shows and conferences. Also located downtown is the Shaw Center for the Arts, which features art exhibits, performances and rooftop dining with spectacular views. In addition to the downtown area, the city of Baton Rouge includes many established neighborhoods, such as Mid-City, with its eclectic mix of local shops and restaurants; the Garden District, with its beautiful older homes; and Spanish Town, known for its ﬂamboyant Mardi Gras parades. Outside the city limits, the parish is booming with both residential and commercial development. Subdivisions, planned communities, upscale shopping areas, restaurants and new movie theaters are springing up throughout the parish. 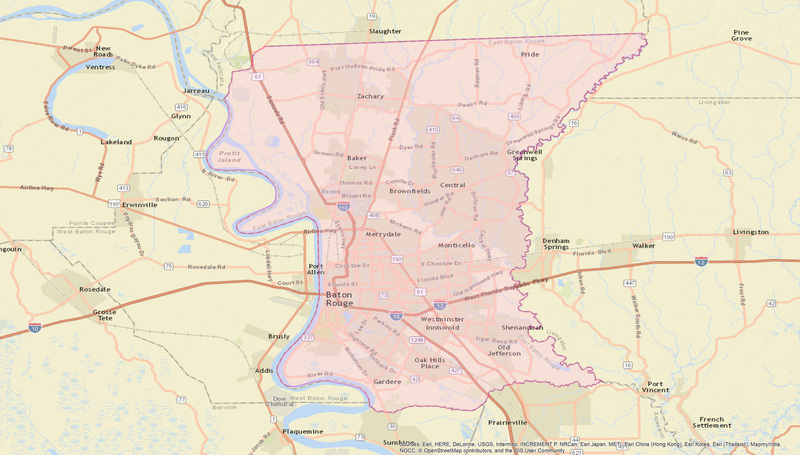 EBR also includes the cities of Central and Zachary. Both Central’s and Zachary’s public schools rank in the top five public school districts in the state. 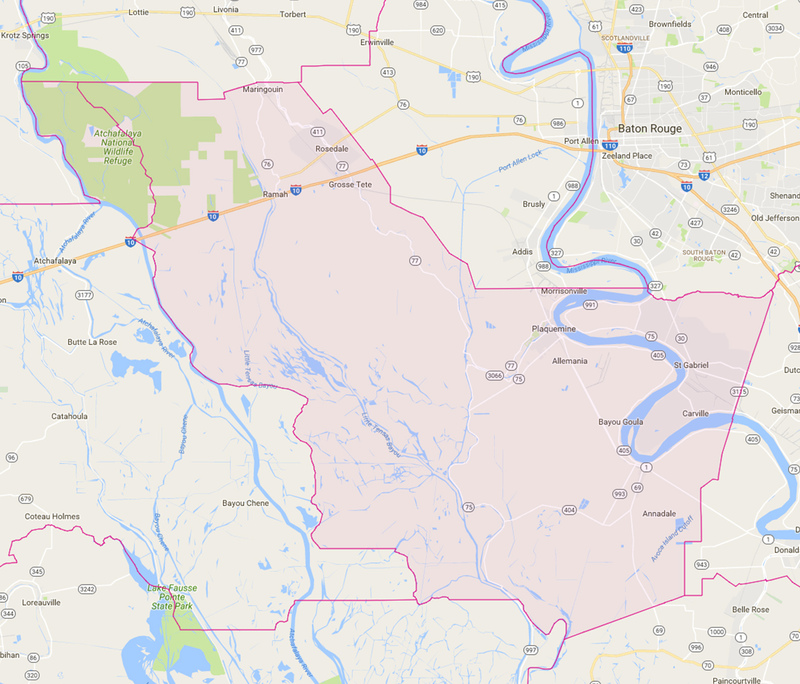 The city of Baker, located just north of the Capital City, boasts plenty of green space, with more than 1,000 acres of parks, over 10 miles of hiking and nature trails, and the ever-popular Baton Rouge Zoo. 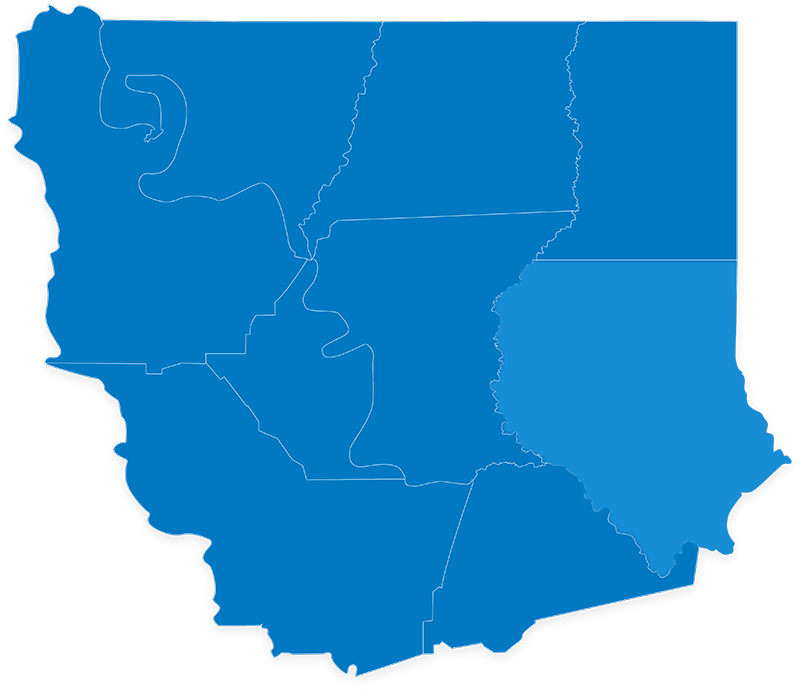 East Feliciana Parish, an area of rolling hills, scenic beauty and historical landmarks, is 30 minutes north of the city of Baton Rouge. The parish includes the towns of Clinton, Ethel, Norwood, Slaughter, Wilson and Jackson, which is known for its well-preserved historic district. Clinton is the seat of the parish government. Iberville Parish is characterized by waterways and bayous, massive live oak trees and lovely antebellum homes. 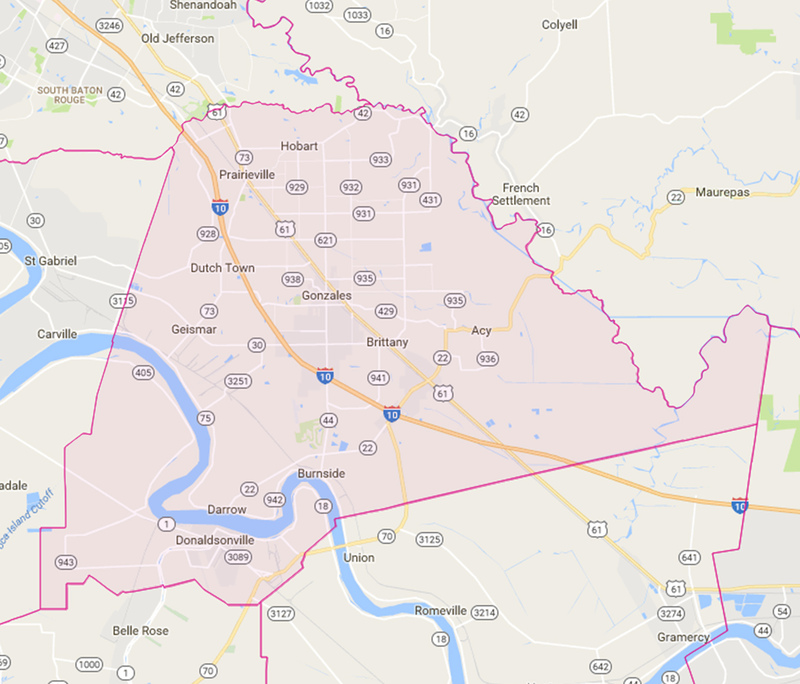 This growing community includes the parish seat of Plaquemine, which features a downtown historic district, an arts and crafts market located in the 1925 Union Pacific Railroad Depot, and the Bayou Waterfront Park. Residents of the city of St. Gabriel can take advantage of a new $4 million community center, which includes an indoor heated pool and fitness area, a large auditorium, and other indoor and outdoor amenities. The town of White Castle is primarily an agricultural community and home to Nottoway Plantation. Nottoway is the largest plantation home in the South and draws thousands of tourists each year. The town of Maringouin (pronounced mah-RING-gwin) is the largest community in north Iberville Parish. This rural area, located on Bayou Grosse Tete, has plenty of open green pastures and live oak trees. It’s an ideal place for those who enjoy a quiet lifestyle. Rosedale is a small rural community of open fields, croplands and winding country roads. With plenty of playgrounds, parks, ball fields, tennis and basketball courts, and lighted walking trails, it’s also a great spot for families. The Iberville Parish Visitor’s Center is located in the community of Grosse Tete. 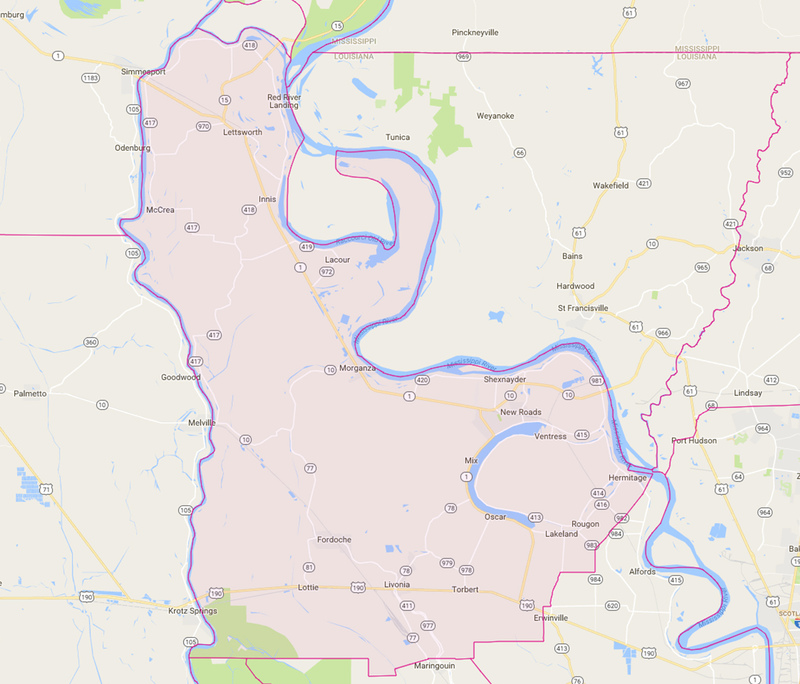 The parish is also home to some of the region’s largest and most successful chemical and petrochemical processing plants, located on the Mississippi River. 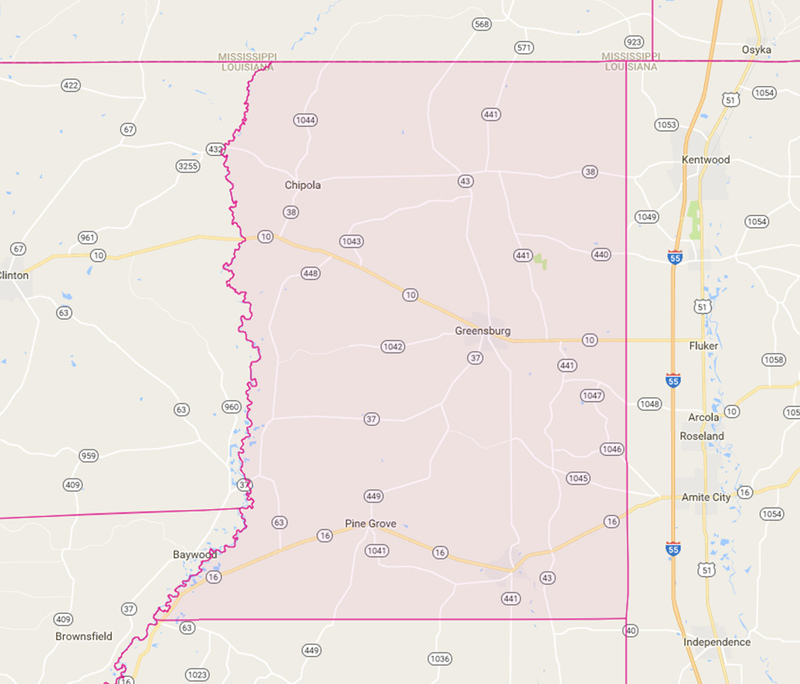 Livingston Parish is located on Interstate 12, just 10 minutes from Baton Rouge and 45 minutes from New Orleans. Denham Springs, the parish’s largest city, is known for its antique shops, and is the location of mixed-use communities Greystone and Juban Crossing. The city of Walker is the site of the 200-acre Livingston Industrial Park and Our Lady of the Lake Livingston. 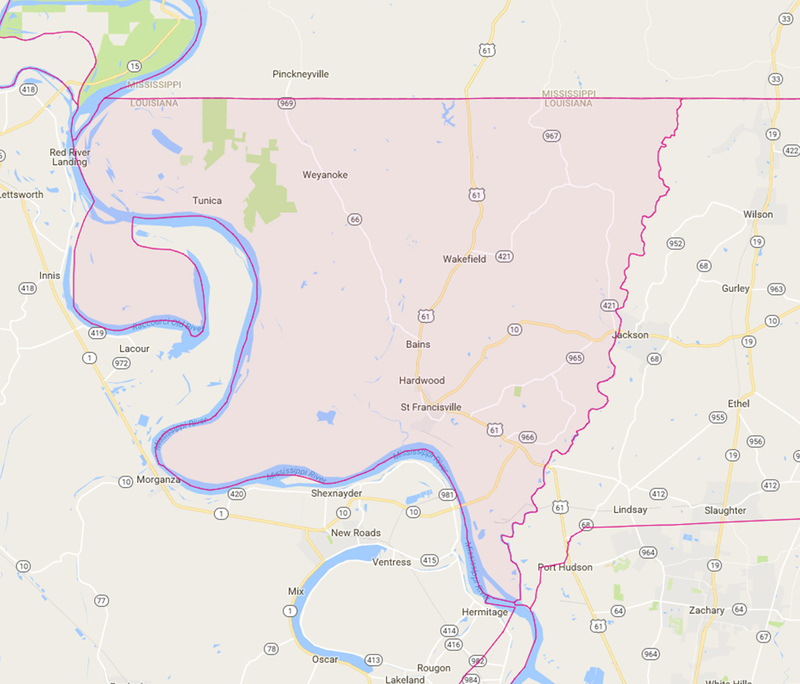 Also within the parish are the communities of French Settlement, which holds an annual Creole Festival; and Albany, site of Hungarian Settlement, a rural ethnic settlement which strives to preserve the Hungarian culture of the town’s residents. The parish seat of Livingston is home to one of only two Laser Interferometer Gravitation Wave Observatories (LIGO) in the country and North Oaks, one of Louisiana’s largest health systems, which provides an array of health care services throughout the parish. The town of Springfield is the site of the 1,200-acre Tickfaw State Park, the golf and residential community of Carter Plantation. Livingston Parish Public Schools rank among the top five school districts in the state. Pointe Coupee Parish is located along the banks of False River. Nestled among moss-draped oak and magnolia trees in the heart of Creole French plantation country, the parish is largely agricultural, with pecan orchards and fields of sugar cane and cotton. Tourists come to Pointe Coupee to see the many antebellum and French colonial homes. It’s also a hot spot for outdoor recreation such as boating and fishing on False River. The parish includes the communities of Fordoche, Morganza, Livonia, and New Roads. New Roads, a progressive city with small-town charm and hospitality, is the parish’s government seat and its commercial hub. Pointe Coupee Parish is home to NRG’s Big Cajun natural gas and coal-fired power plant which produces 1,925 MW per day. In 2011, the John James Audubon Bridge was completed and connects Pointe Coupee with West Feliciana Parish. Rural St. Helena Parish is one of four historic West Florida parishes. The parish seat of Greensburg contains the original Florida Parish Land Office, a small Greek revival-style office building, as well as the Old St. Helena Parish Jail building. St. Helena is also the site of Louisiana’s only meteor impact crater. The parish’s primary industries are related to timber and agricultural processing. West Baton Rouge Parish is located on the west bank of the Mississippi River. The city of Port Allen is the seat of government of WBR and is also the site of the Port of Greater Baton Rouge. The port, located at the head of deep-water navigation on the Mississippi, has Foreign-Trade Zone status and facilities that can accommodate the import and export of all types of cargo. The Port of Greater Baton Rouge is the furthest northern port on the Mississippi River for deep-draught vessels (Panamax ships), and it is among the 10 largest ports in the U.S. The Port Allen Lock provides boat and barge access to the Intracoastal Waterway. WBR also includes the historic railroad town of Addis and the town of Brusly, location of the Cinclare Sugar Mill Historic District. West Feliciana Parish is located 30 minutes north of Baton Rouge in the rolling Tunica Hills. It’s most famous for the Town of St. Francisville, where John James Audubon created more than 80 paintings in his Birds of America collection. St. Francisville also has a number of antebellum plantation homes open to the public and a quaint historic downtown area. In 2011, the John James Audubon bridge was completed and connects West Feliciana to Pointe Coupee Parish. 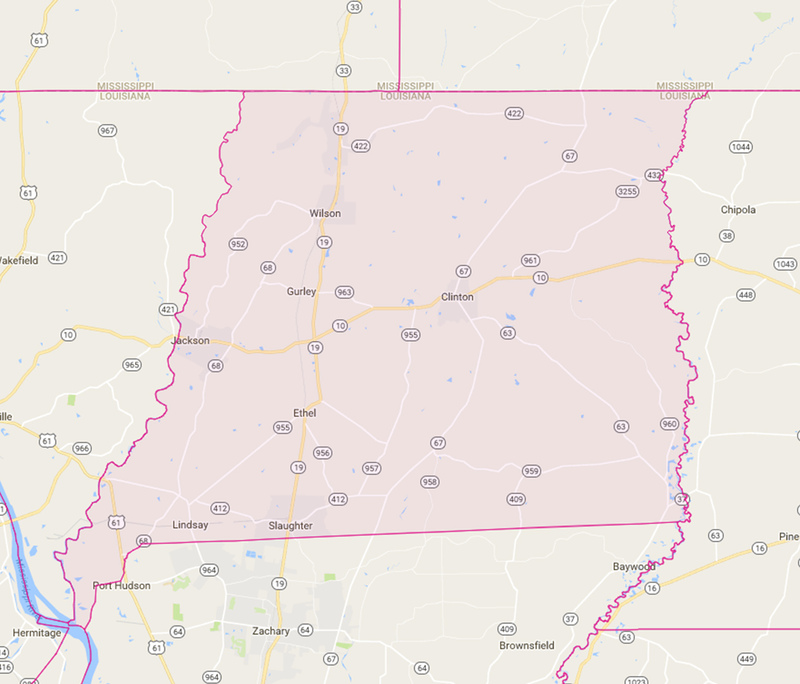 Access to US Highway 61 is available within the parish. Additionally, West Feliciana is home to the 998 MW River Bend nuclear power plant operated by Entergy. There are plenty of places for outdoor activities including the Cat Island National Wildlife Refuge, Tunica State Park, Audubon Historic Site, and the Port Hudson Civil War Battlefield. Biking, hiking, birding, and golf are popular recreational pastimes in the area. West Feliciana Public Schools rank among the top five school districts in the state.